Poached farm egg from Wild Thyme Farm. Goats and Gourmets chevre and creamy Wild Hive Farm polenta, carrot puree, pork cracklins from White Clover pork. 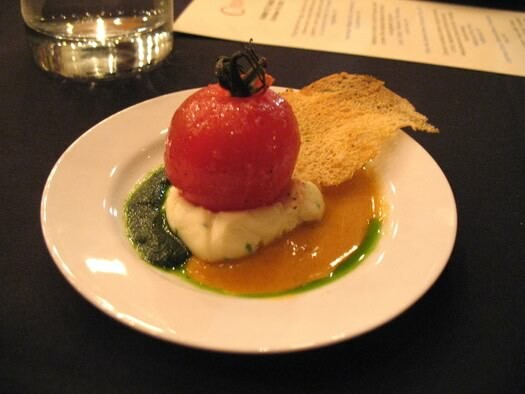 Heirloom tomato from Purple Gunder, ricotta mousse, basil puree, fire roasted heirloom tomato, vinaigrette. 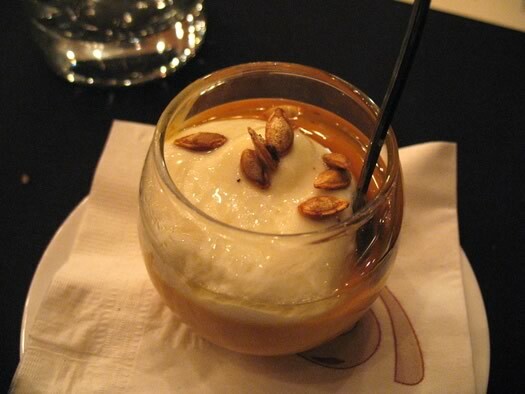 Savory roasted butternut squash (from Purple Gunder) panna cotta, Maplebrook Farms burrata, Meadow Brook brown butter, toasted squash seeds. 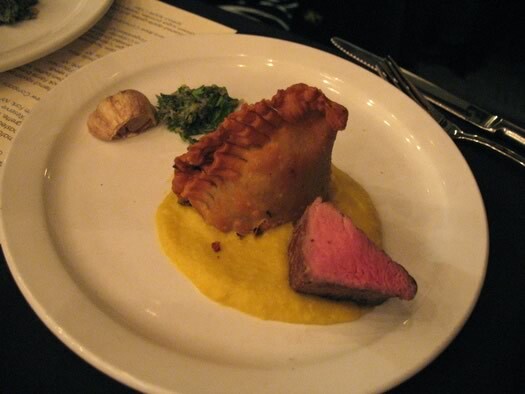 White Clover Farm sous vide beef, roasted garlic sage "chimichurri," roasted corn pudding, braised chard empanada. 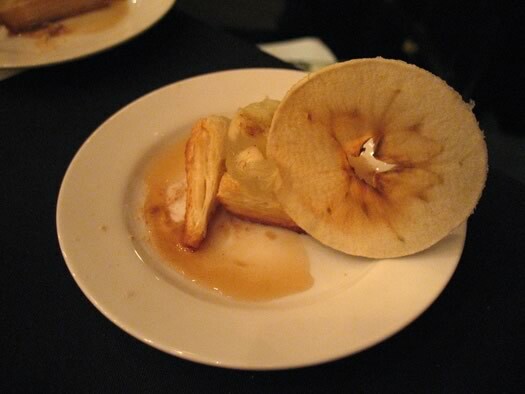 Pan roasted apple gelee, puff pastry, brown sugar powder, apple chip. 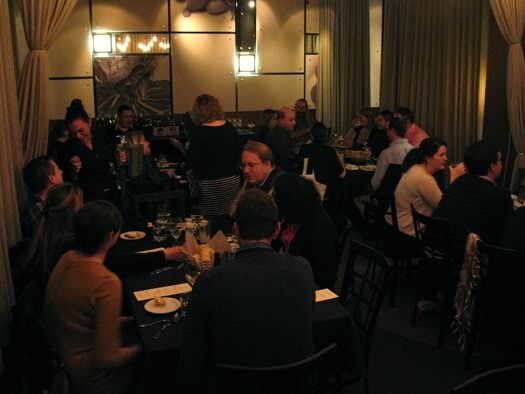 Many thanks to chef Brian Bowden and his crew at Creo for preparing a very enjoyable meal. + Stephanie posted pics and a little bit about her favorite dish. + Here's a big recap by Daniel. + Here's a recap with photos by Jerry. + And there's a photoset on Creo's Facebook page. As you probably know, Creo does advertise on AOA. That's how we were able to set up this dinner. AOA always puts on a great party! Thanks for a great event! It was great meeting everyone. It was a great event! I look forward to more in the future. 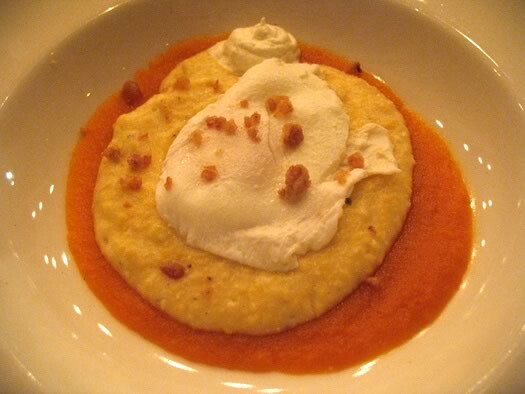 I dreamt about two dishes from the evening: the Poached farm egg, chevre, polenta, carrot puree, pork cracklins dish and that roasted butternut squash panna cotta. Serious Yum! What a great evening! The food and company couldn't have been better. Thank you AOA! phenomenal, the company and the food. I long for another farm-to-table dinner soon, but my pocketbook balks.